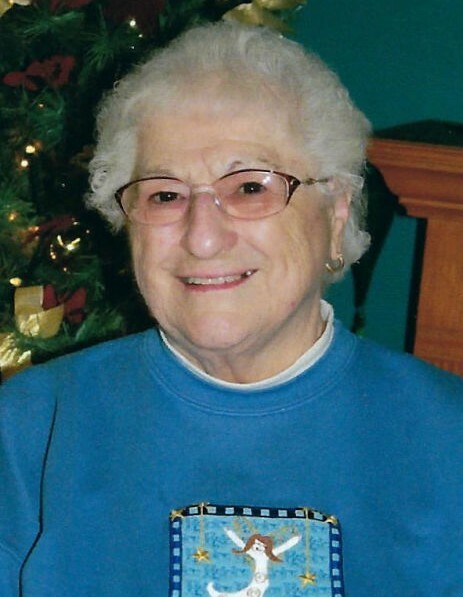 Donna Jane May Peterson, age 89, of 2522 South 22nd Street in Escanaba, passed away late Wednesday, January 16, 2019 at Christian Park Healthcare Center in Escanaba. She was born on April 25, 1929 in Escanaba, the daughter of George and Marion (Warner) Lundeen. Donna grew up in Escanaba and was a graduate of Escanaba High School. She moved to Chicago and furthered her education at North Park College. A couple of years later, Donna returned to Escanaba. The former Donna Jane May Lundeen married Emer Richard Peterson on May 10, 1952 in Escanaba and he preceded her in death on January 7, 2002. Together, the couple shared nearly 50 years of marriage and raised 4 children. Donna and Emer owned and operated Bay de Noc Roofing Company for several years where she was in charge of the bookwork. She also was proud to be a homemaker, caring for her family and raising the children. Over the years, Donna used her singing talent and performed for many church and funeral services. She enjoyed wintering in Tavares, FL for many years with her husband, loved spending time with her family, and had a huge place in her heart for her cat. Donna was a member of the United Evangelical Covenant Church of Escanaba and later in Gladstone, and was a member of the Rebekah’s Lodge where she held office of Nobel Grand. Donna will be missed by all who were fortunate to know her. Donna Jane May Peterson is survived by daughters, Leslee Kempes of Joliet, IL, and Kristine Peterson (Daniel Thelen) of Cornell, MI; sons, David Peterson (Denise Makosky) of Escanaba, and Steven Peterson of Escanaba; 2 grandchildren; 4 great-grandchildren; sister, Karin (Kip) Cherry; and several nieces and nephews. In addition to her parents and husband, Donna was preceded in death by son-in-law, Jim Kempes; and 2 sisters, Betty Sawyer, and Mary Ellen Lee. Visitation will be held from 12:00 p.m. to 1:00 p.m., Tuesday, January 22, 2019 at the United Evangelical Covenant Church in Gladstone. Funeral services celebrating the life of Donna will follow at 1:00 p.m., Tuesday, with Pastor Aaron Anderson officiating. A luncheon will be served at the conclusion of the services in the church fellowship hall. Burial will take place in the South Ford River Cemetery.